When the time comes to reflect back on life, few people ever wish they had a bigger house or more money in the bank, but for most it’s a deliberation of lifestyle! A typical working day in the life of a PADI Divemaster or Instructor on Utila starts with a morning commute to the dive center, cycling through the narrow streets of this traditional Caribbean island on their way to work and to meet their divers for the day and prepare the boat trips. But their journey isn’t over yet, because next they travel to one of the many dive sites around the island of Utila (up to 80 buoyed sites) by boat, to then guide a group of divers on a wall dive. If they’re lucky, they often get to stop and swim with dolphins or whale sharks on the way. 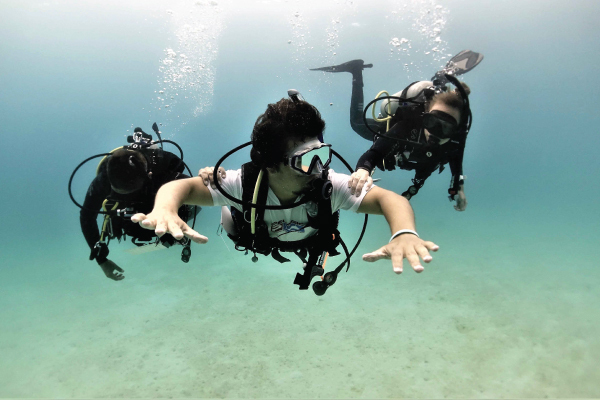 The island of Utila is small, friendly and convenient for dive training, no traffic, congestion or commercial development that often accompanies mass tourism. The island of Utila represents the traditional Caribbean and has escaped the commercialisation and mass development often seen in other tourist/scuba dive destinations and is surrounded by fringing reefs, deep walls and offshore sea mounts and with unlimited diving included in our scuba diving internships and a fleet of 5 boats you get to really build your experience, awareness and comfort in the water as a dive professional. Every year there are a number of dive visitors to the island of Utila, from backpackers on ‘gap years’ to high level executives on a short vacation, and they come to Utila for many different reasons, from learning to dive to swimming with the majestic Whale Sharks. Maybe they’re looking to refine their dive skills with a Rescue Diver course, to ‘Go Pro’ on one of our PADI Instructor Development Courses held right here on Utila and become a PADI Divemaster, or to make a challenging technical trimix dive on the deep walls of Utila’s North side, or advance their dive training and learn how to use a closed circuit rebreather. Other divers want to learn more about marine biology and conservation with our CoralWatch reef surveying and the scientific side of our Government licensed Coral Nursery. As a PADI Scuba Instructor on Utila you’ll never find a job that has so much variety. Sometimes, you’ll be introducing a group of international backpackers to the delights of the under water world with the PADI Open Water diver course, guiding beginner students through one of the most unique multisensory experiences they can ever engage in (trust us when we say that these are one kind of customers that will never forget you for the work you do). At other times in your daily duties, you’ll be conducting professional dive courses with the PADI Divemaster program and taking ex-bankers, computer engineers, mechanics, lawyers, doctors, and factory workers under your wing and guiding them into the ranks of dive professionals, sharing your own experiences of tropical dive resort management. At Utila Dive Center we’re also the most comprehensive facility in Central America and the Caribbean facility to advance your education and training as a dive professional with specialised training in many PADI specialty areas including nitrox, gas blending, equipment repair, sidemount diving, and also certifications and training in boat handling through International Yacht Training, adaptive teaching courses with International Association of Handicapped Divers, equipment repair with our ScubaPro Resort Technicians course and dive safety/first aid courses with the Divers Alert Network. Rather than hiding from bad weather and indoors at lunch time or rushing to find something suitable to eat in the little time you have in most professions, you’ll find that in the Caribbean lunch times can be spent for hours in one of the many island cafes, catching up with colleagues on their morning aquatic encounters, whilst afternoons may involve hammock time or teaching dive academics in the classroom to aspiring divers. In the evening enjoy an apres-dive social setting as the sun sets slowly into the sea in spectacular Caribbean style. As far as the quality of life on Utila and as a dive professional goes, a testimony to the great way of living on this island is that most people who visit for just a few days often end up staying for weeks or months, if not years, longer than they had originally intended. There are a lot of European and North American ex-pats living on Utila and as such there is a great flair of international cuisine and bars and restaurants. Of course, if it’s a quiet night (in that you feel you deserve it) then there’s no better place to relax in the evenings than Utila. Most apartments and homes have outdoor balconies where you can gaze at the stars or look out to an ocean view, including modern amenities to ensure you have the creature comforts that you may be accustomed to. Every year we are privileged to introduce people from all walks of life to becoming scuba dive professional and help them find employment as PADI professionals on Utila and throughout the Caribbean and Central America, and worldwide. We are often so impressed with the attitude and caliber of our candidates that we hire them and help them live this dream lifestyle on Utila. 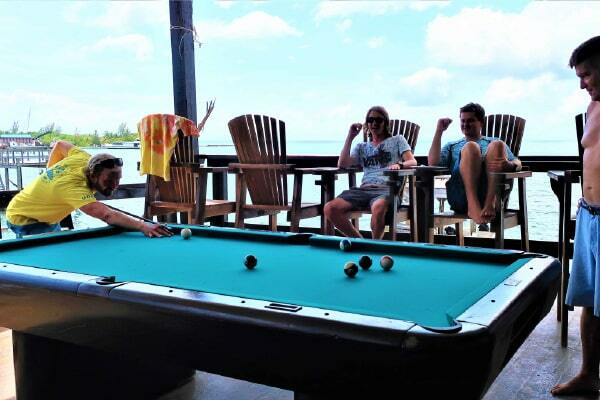 Many of our staff have worked and dived in many parts of the world (Koh Tao in Thailand, South Africa, Maldives, Dahab in Egypt, Costa Rica), and in addition to the great diving they also enjoy the friendliness and great quality of living on Utila. So much that many years later we all still look forward to our daily work and evenings at home or in good bars and restaurants with a welcoming ambience. The average cost of living on Utila is about $500 per month with another $150-$250 for suitable accommodation (that’s right! ), and is probably why most visitors to Utila call it one of the best value destinations in the Caribbean. As an active PADI Instructor in a reputable facility don’t be surprised if you actually find that you are able to save 2-3 times more a month than you actually spend. That’s why when most dive Instructors on Utila do decide that the time has come to move on, they have usually saved enough to head off to the next exotic location. The only problem is: Where next? Hawaii, Galapagos, Thailand or Australia: well, that’s one question we’ll let you answer. Are you up to the challenge of an exciting career as a Dive Professional?